For the past six months I’ve been part of a Facebook group called, MEFFT (Middle East Food for Thought), or, as we commonly like to call ourselves, the “penguins.” I’m not altogether sure who adopted the penguin idea, but, as is usually the case among this group, we consensually and enthusiastically embraced our little mascot. Mainly because the penguin’s a peaceful little guy, nurturing and having fun in his community of fellow-minded penguins. It’s the peaceful part that really mattered to us all. Our group’s premise is: “If you are open minded, love the idea that peace is better than war and eat at least 3 meals a day, you are welcome here.” Simple, really. 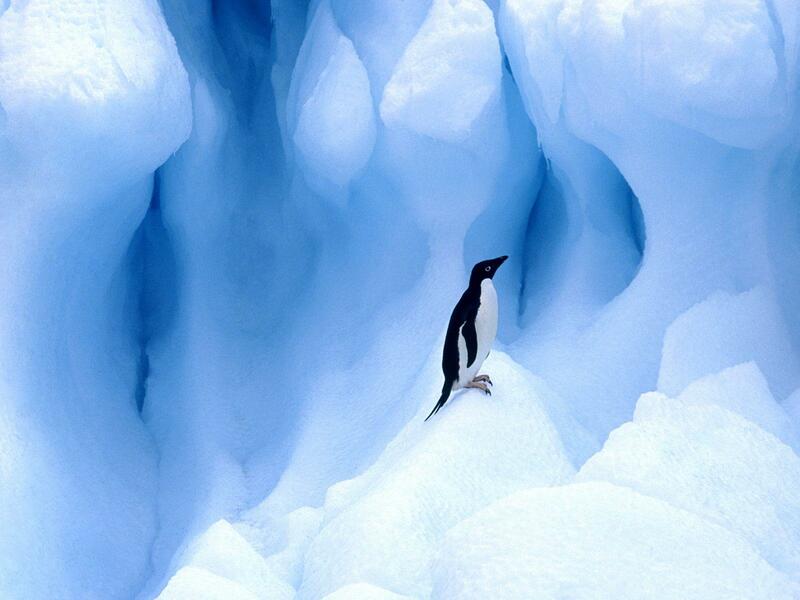 Individually, though, we are more like the lone penguin in this image. We’ve all spent time pondering, pausing, imagining a world less violent than the one we live in. We herald from many different places: America, Egypt, Pakistan, Bulgaria, Australia, Germany, England, New Zealand. We practice many different religions and faiths: Judaism, Islam, Buddhism, Christianity, Coptic Christianity, Agnosticism, and Atheism. Most of us break the rules and eat more than three meals a day, and yes, we all absolutely adore eating and talking about food. Constantly. Often our food choices lead to in-depth discussions about faith, fasting, ritual, and culture. There are many conversations that surround what constitutes “food” in the first place. The definitive answer on pop-tarts has not yet been decided, and the juries still out on the necessity of frosting or no frosting. We have fun. But we are also a learning community. Not a day passes when I don’t learn something new about another religion or culture. The greatest lesson that I’ve learnt, and would go as far to say that all of our group members have learnt, is that it’s possible for different faiths — even those with a history of violent interaction — to come together in peace and abundant laughter and support. When we’re open to the idea that we are all in this together, when we’re all willing (as the man said), “to give peace a chance,” our differences dissipate and we truly bond together in fellowship and mutual respect. This group has opened up a new world to me, and, unexpectedly, a reawakening of all of my nagging questions about faith. The most pressing one being do I have any faith. I used to. I used to have a rock solid faith — in Christ, in Christianity. Then Christianity started looking less and less like Christ. As E. Stanley Jones, in his The Christ of the Indian Road, quoted Gandhi as saying — “I love your Christ, but I dislike your Christianity… I [Gandhi] would suggest that all of you Christians live more like Jesus Christ…I would suggest that you practice your Christianity without adulterating it…I would suggest that you put more emphasis on love, for love is the soul and center of Christianity…I would suggest that you study the non-Christian religions more sympathetically in order to find the good that is in them, so that you might have a more sympathetic approach to the people.” Gandhi’s keen observation of Christianity was exactly what I experienced in my church, in my Christian fellowship. Ironically, never have I felt so unloved as when I fellowshipped within “Christian” churches. Admittedly, I sure picked some doozies. In 1986, I left New Zealand for my OD (overseas experience), a rite-of-passage that most kiwis take. Eventually I made it to Edinburgh, Scotland, the place where my father was born. There, I met and married a man who was a charismatic, sweet-talking, larger-than-life, risk-taking entrepreneur. Someone my mother should’ve warned me about. Part of my marriage pact to him included becoming a member of a “Christian Church,” known as The Way Ministry. The Way International was founded in New Knoxville, Ohio, in 1957 by Dr. V.P. Wierwille. Later, we’d find out that even the “Dr” was bogus. V.P. Wierwille’s church was successful in America and had branched out internationally. Their second largest branch was on a property called, Gartmore, near the Highlands of Scotland. As the Catholic owners would not negotiate with a cult, my husband had found and purchased the property for the Way Ministry, At the time I had no idea what a cult encompassed. Later, I was baffled at my own doubt, at not trusting my own gut instincts which were shouting, “run, run.” But one of the most insidious devices of a cult is isolation. Manipulation and exploitation soon follow. And in my isolation from the real world, and my total immersion in the life of this “church,” it was almost impossible to think clearly, and, quite frankly, rationally. This particular cult was also highly adept at secrecy. After all, they held the “only true accuracy to God’s word,” and it was therefore guarded by the worthy patriarchs, and the stockpile of arms that most of us were unaware of. A stockpile of weapons, housed in an area where the most dangerous threat wore a kilt, and carried some haggis ‘n ‘neeps, cemented any doubt at all that this was truly a textbook, working cult. More harmful than the weapons, though, were the words and actions of the patriarchs of The Way Ministry. Weirwille preached the “gospel of King David,” encouraging lower ranking church members to share their wives (as a blessing) with the patriarch of the ministry. He, and many, many other church patriarchs, ruined and destroyed countless marriages, and sexually abused unmarried women, all around the world. This practice was also bound in absolute secrecy through whatever means necessary. By the time the majority of the Way members found out the truth of this “Church” — the “Church” that they’d wholeheartedly followed, many giving their life savings to (yes, another cult cliché), it was far too late. Following an absolute ministry implosion, in which leaders exposed other leader’s flaws and sins, and in which the members of the Way were all sent long, and rambling letters containing accusations and “the truth,” we, too, decided enough was enough. We formally left the cult and at least half of its members followed suit. In Germany, a former Way member that we knew shot and killed his housemates and then turned the gun on himself. There were many suicides. There were many divorces. There was a sense of loss that can’t easily be explained. For me, personally? I lost my faith in faith. It didn’t happen instantly. The Way Ministry had been a huge part of my life, and so for a time I searched for a Church to replace them. I tried several non-denominational churches in Rhode Island (where I’d moved in 1991), but the minute they claimed to be the “one and only truth” I was outta there. Fool me once… Mostly, though, I just grew so damn tired of the same rhetoric of righteousness, condemnation, and elitism. Even one of the most liberal churches that I found, here in Lexington, KY, where I now live, has a problem with homosexuality. Exit stage left. Religion is like buying a property. You have to find the right dimensions, style, substance, traditional or modern and so forth. So far none of them have quite suited me. And I’m fine with that. These days, at best, I call myself an Agnostic. For when tragedy hits, or when my friends are hurting, I still turn to God. I figure that even if I’m cursing him/her, then part of me must believe in his/her existence. I try to live each day in a manner that’s kind, compassionate, non-judgmental, and I often fail. I think Christ, Buddha, Mohammad, the Dalai Lama, and even the current Pope are worthy of worship. Each day I lose more faith in humanity, while my faith in nature expands. My “penguin” friends, however, have given me a new sense of hope. Hope, that on a very small scale, and if we are open to the possibility, we can break bread and join in fellowship, regardless of religion, nationality, culture. And it even kinda irks me that my MEFFT group has me questioning my faith in faith. ‘Cause I’m ok being a nomad. But I’m not entirely ruling out all the other possibilities in this world, or the next. **Today, the cult ministry that I knew is now named “The Way International.” It still exists, and, at least in cyberspace it looks much the same “front” as the old cult. The biggest difference being that there is an absence of the name V.P. Wierwille. Very telling. Another beautiful, surprising, and thought-provoking post, Nikki. Muchas, muchas gracias. I was never deeply religious, despite my having grown up in the Holiness church, but I was always a religious devotee (seems contradictory, I know). It was the Holiness church that caused me to lose my faith. I saw the hypocrisy, the sexism, the classism, and the internalized racism (among Black parishioners), and I experienced the hatred and bigotry. As a kid, I experienced firsthand the homophobia (though I was silent about my burgeoning sexuality) and was convinced I would “burn in hell” for being who I knew myself to be. I made a pact with “God” at twenty: “You had the first twenty years. Let me have the next twenty to make sense of it all. When I’m done, we’ll talk.” It was the loss of my sisters that restored my faith in “God” (or, perhaps, drove my need to have again the companionship my faith/belief had before provided). We, “God” and I, had/have always been tight — friends, comrades, confidantes, beloveds. I don’t know who or what “God” is, but I do know that I today appreciate the relationship we have. I also know that I am crazy (in the best sense of the word) about her/him/it/spirit. What a life you have led! I look forward to learning more…. Thanks, my friend, for your post. Cheryl, isn’t it so sad that a church causes one to lose faith. How Christ would weep. Thanks for sharing the story of your pact– I love it. It’s so Cheryl. The crazy Cheryl whose friendship I love so much. You always make your sisters proud. Speechless. Utterly speechless. You rock. Period. Thanks, Joe. I really appreciate your input. What a fascinating and beautifully written post! Your Facebook group sounds especially interesting. I’ve long been interested in the intersection of faith and food. It may have begun with that food curriculum we developed in the Writing Program some years ago. I also have some background In a “Christian” cult, as well–though I’ve not written about it yet. I surely will. The long and short of it is this–I love your blog. I love your reflections and insights. You write well. You make me think. And for all of these, I thank you. Thanks so much, Kathy. I’d love to hear about your “Christian” cult experience. I have yet to read your blog this week. Hoping to catch up this evening.